Created by Kaplan Director Wendy Wall, Northwestern’s MAD Studio, and an international team of nine core scholars, the site will invite analysis/elevation of the 17th century poet Hester Pulter. "The Director's Prism: E.T.A. Hoffmann and the Russian Theatrical Avant-Garde" cited in Best Performance Design+Scenography category. Peter Erickson article in Second Norton Critical Edition of "Adrienne Rich Poetry and Prose"
Congratulations to Kaplan Professor in Residence Peter Erickson! 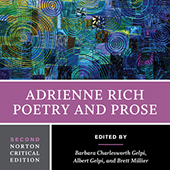 His article "Singing America: From Walt Whitman to Adrienne Rich" has been published in the Second Norton Critical Edition (2018) of "Adrienne Rich Poetry and Prose." Kaplan year-end booklet — digital version now online! Mary Dietz (Political Science; Gender & Sexuality Studies) and Kelly Wisecup (English and Center for Native American and Indigenous Research) will pursue projects related to humanities work in a changing climate.